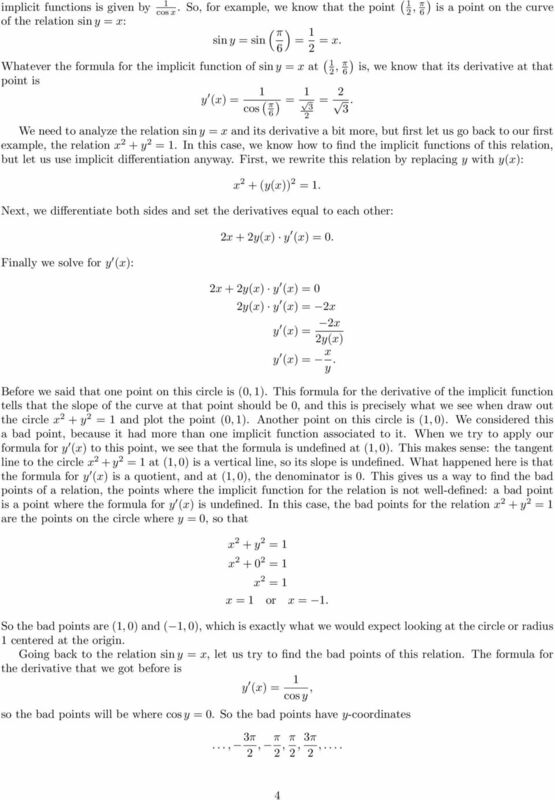 Download "x 2 + y 2 = 1 y 1 = x 2 + 2x y = x 2 + 2x + 1"
2 point (x, y) which satisfies the original relation (in other words, a point on the curve defined by the relation), and to take an implicit function h(x) for which y = h(x) (that is, an implicit function for which (x, y) is on the graph of that function). We call h(x) the implicit function of the relation at the point (x, y). For example, we have the relation x + y = and the point (0, ). This relation has two implicit functions, and only one of them, y = x, has the point (0, ) on its graph. This fits our intuitive idea of an implicit function from the introduction to this lecture, because the graph of this implicit function is the upper half of the circle. If, however, we took the point (0, ), then the implicit function of x + y = at this point is y = x. Sometimes a point has more that one implicit function associated with it. For the relation x + y =, take the point (, 0). Both the implicit function y = x and the implicit function y = x have the point (, 0) on their graphs. In a sense, a point which has more than one implicit function associated to it is a bad point for the relation. Can you find another bad point for the relation x + y =? There is a way to identify bad points for a relation, which we will see when we learn how to differentiate implicit functions. 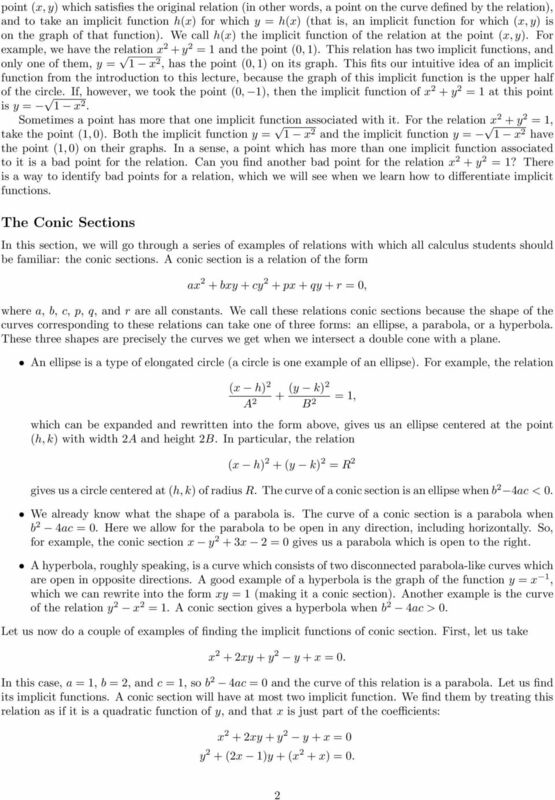 The Conic Sections In this section, we will go through a series of examples of relations with which all calculus students should be familiar: the conic sections. A conic section is a relation of the form ax + bxy + cy + px + qy + r = 0, where a, b, c, p, q, and r are all constants. We call these relations conic sections because the shape of the curves corresponding to these relations can take one of three forms: an ellipse, a parabola, or a hyperbola. These three shapes are precisely the curves we get when we intersect a double cone with a plane. An ellipse is a type of elongated circle (a circle is one example of an ellipse). For example, the relation (x h) (y k) A + B =, which can be expanded and rewritten into the form above, gives us an ellipse centered at the point (h, k) with width A and height B. In particular, the relation (x h) + (y k) = R gives us a circle centered at (h, k) of radius R. The curve of a conic section is an ellipse when b 4ac < 0. We already know what the shape of a parabola is. The curve of a conic section is a parabola when b 4ac = 0. Here we allow for the parabola to be open in any direction, including horizontally. So, for example, the conic section x y + x = 0 gives us a parabola which is open to the right. A hyperbola, roughly speaking, is a curve which consists of two disconnected parabola-like curves which are open in opposite directions. A good example of a hyperbola is the graph of the function y = x, which we can rewrite into the form xy = (making it a conic section). Another example is the curve of the relation y x =. A conic section gives a hyperbola when b 4ac > 0. 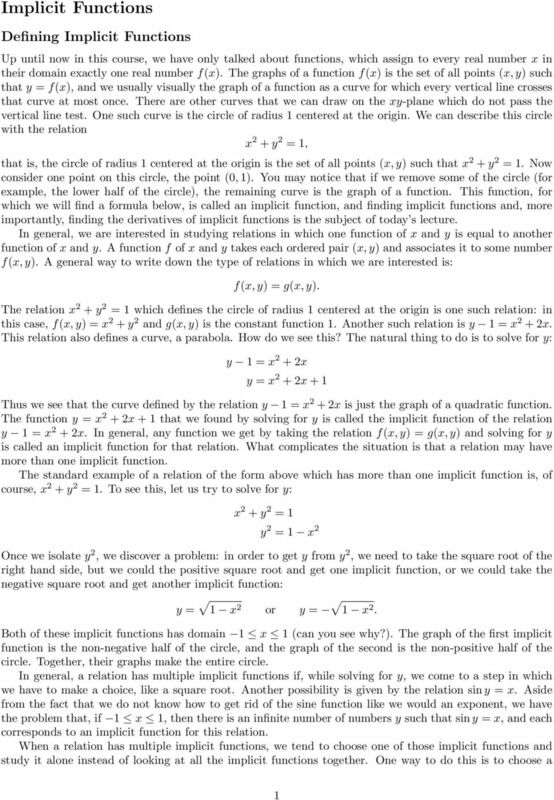 Let us now do a couple of examples of finding the implicit functions of conic section. First, let us take x + xy + y y + x = 0. In this case, a =, b =, and c =, so b 4ac = 0 and the curve of this relation is a parabola. 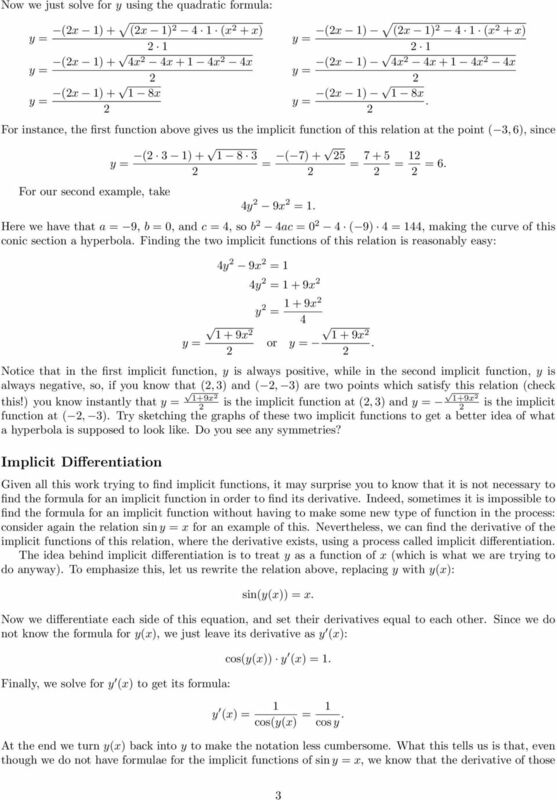 Let us find its implicit functions. A conic section will have at most two implicit function. We find them by treating this relation as if it is a quadratic function of y, and that x is just part of the coefficients: x + xy + y y + x = 0 y + (x )y + (x + x) = 0.
x 2 + y 2 = 25 and try to solve for y in terms of x, we get 2 new equations y = 25 x 2 and y = 25 x 2. 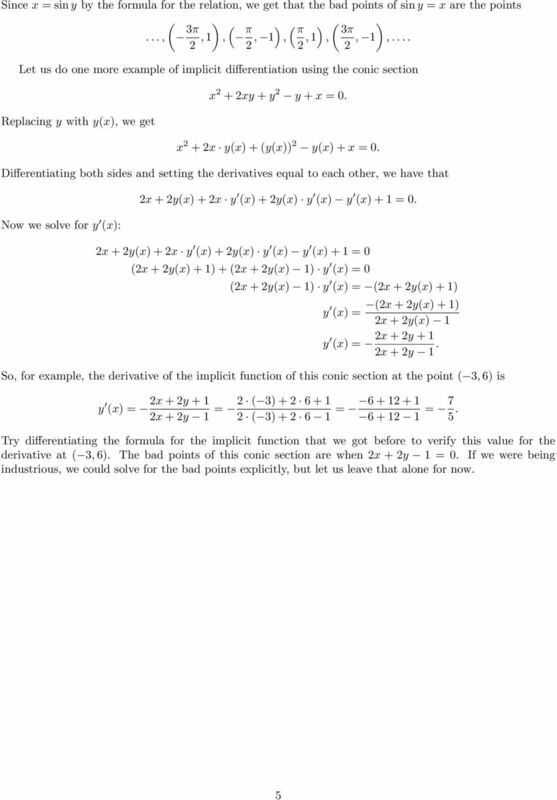 Linear and quadratic Taylor polynomials for functions of several variables. Simplify the rational expression. Find all numbers that must be excluded from the domain of the simplified rational expression. 1.4 Exponential and logarithm graphs.